With developers' eyes fixed on Broad Street and Washington Avenue, Alterra Property Group is moving closer to a go-ahead for its mixed-use apartment complex on the west side of the intersection, across from the site where Bart Blatstein has proposed several iterations of his 32-story tower megaproject. Lincoln Square, a $100 million proposal between Alterra and MIS Capital, features an eight-story complex with 356 apartments and 74,000 feet of retail space, including a supermarket and a public walkway joining Broad and 15th streets. The project would also preserve a 19th-century rail shed that once was a pit stop for Abraham Lincoln's body after his assassination. This week, designer BLT Architects revealed several new renderings of the Lincoln Square proposal that demonstrate why local residents and city officials have been much more receptive to it than Blatstein's tower. There's virtually no obstruction of the Center City skyline. 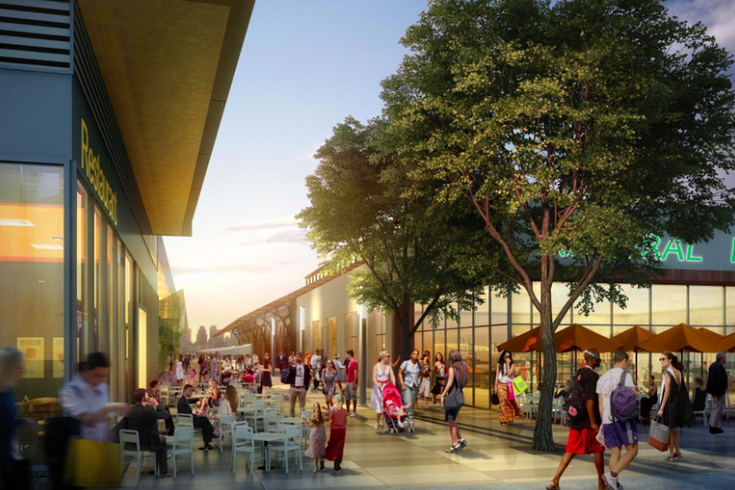 A three-story parking garage actually offers an incredible view of the city from South Philadelphia, and instead of a fourth-floor retail village as proposed by Blatstein, most shops at Lincoln Square would be at the ground-level. 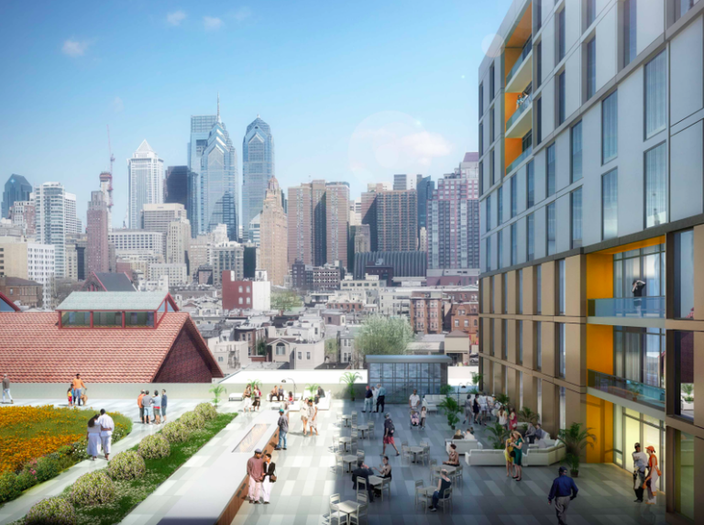 A spokesperson for MIS Capital told Curbed Philly that the renderings are very preliminary and remain subject to significant change. Still, after Blatstein's project tweaks fell flat with the Civic Design Review Board, progress with Lincoln Square is an encouraging sign. Two bills are on the table in City Council to rezone the 3.36-acre lot, according to Plan Philly, and if things move according to a suggested timeline, the project could begin construction in March 2017. Alterra has several other properties throughout Philadelphia, including the Avenir apartments on S. 15th Street, the Icon at 1616 Walnut Street and the Shirt Corner apartments at 3rd and Market streets.